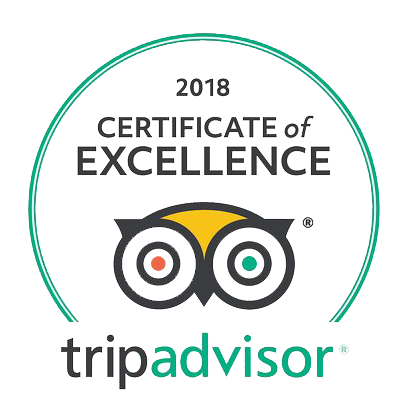 Linden Tree Retreat & Ranch is a proud recipient of the 2017 Certificate of Excellence Award by Trip Advisor. TripAdvisor is the definitive source for unbiased reviews on international travel destinations. The testimonials listed below for Linden Retreat & Ranch have been posted on the TripAdvisor website by previous guests of the ranch – families, couples and individuals from all over the world. There is only one word… one of the most peaceful and magic places on Earth. A great team, organic food, time for yourself and your children. The owners care personally for every guest and treat them like a friends. Don’t ask what they do, just why and how. Everything I know about horses is what horses taught me… Big thanks to Lucky Luke for reminding me of what these beautiful animals can teach us when we approach them with love, tenderness and trust. And not just that, but the way they teach – an acceptance that happens at the moment and a whole new Universe opens, one of relationship and communication. Special richness and portal to a new dimension of understanding Silence and Movement. Dear Linden Family, until now I’ve had a fair share of meeting all kinds of people, but after Sunday I have to say, you are a real deal.No better recipe for dealing with everyday challenges than spending time with you in this beautiful nature. My lungs are filled with special kind of clear air, my eyes are bursting from colors surrounding me, in my mouth, I can still feel the taste of an apple from my childhood and my heart is full and growing from the love that you gave to all of us. Until we meet again, Nena. Amazing ranch, definitely visit if you’re in Croatia! To start, the staff were all amazingly helpful and made our stay fantastic. There’s a 2 hour hike from the ranch that I highly recommend. You will go through the woods to a cave that has incredible views along the way. We only stayed one night at the ranch but wish we booked a few more to experience more of the amenities and activities. The food was generously portioned and cooked to accommodate my wife’s gluten allergy. We hope to be able to visit again! Warm welcome, Very kind people and excellent food! It was the best time for me in Croatia, too short unfortunately because the place is so relaxing and comfy! Great activities to do all through the year, I will come back for sure! We had a great and unforgettable time at Linden Tree. Linden Tree is an oasis of peace located in the beautiful countryside in the middle of nature. The people working there are all extremely friendly and welcoming – we immediately felt at home. The food was absolutely delicious – always prepared freshly with products from the region. The rooms (we stayed in the Tipi, which was an exciting experience) are all nicely furnished with a lot of attention to the small details. We did a day ride which took us up the mountain and highly recommends this to everyone. The views were breathtaking and the horses unbelievable. I have never ever experienced so reliable and sure-footed horses (and believe me, I have ridden many horses in the past 30 years). We stayed here for two days on a small group holiday. A lovely, restful setting that feels miles away from anywhere. The living room area where we ate had a log burner and was decorated with fairy lights in the evening and artifacts originating from America- It was very welcoming as we had got soaked earlier in the day walking the Plitvice Lakes in the rain. Food is all homemade and locally sourced – delicious. The best breakfasts too of our week in Croatia – thoroughly recommended! Went for the two-hour trail ride at linden ranch. It was a once in a lifetime experience, crossing creeks and climbing through the thick of the forest. The guide Daniella was great! And Tina was extremely helpful via email. It was overall an excellent experience. I highly recommend linden tree retreat and ranch. Linden Retreat is a fantastic place for people who want to enjoy spectacular nature without any artificial attraction. Maggie, Bruce and their team do a fantastic job creating an environment that makes visitors sunshiny. The surroundings are spectacular, the rooms are top quality in comfort and individually designed … Food is perfect and the relaxed atmosphere makes the visit special. I’ve been there now there times (and I’ll come back), every time was special. For people who like outdoor activity like riding, biking or trekking it’s just THE place to go. For those who do not yet, it’s an awesome place to try. Me and my boyfriend Aurelien had a very good experience at the Ranch. We arrived late and we camped with our own tent outside. They gave us some blanket and hot boiled water to be sure that we will be comfortable. The day after, the weather was rainy but it was a pleasure to stay inside, close to the fire… eating the delicious breakfast, playing guitar, harmonica with a cup of tea. After all, we had our two-hour ride under the sun! We felt lucky, young & free! A huge thank you to all the staff who welcome us with open arms. Merci pour tout et pourquoi pas à bientôt.